in compotes and fruit desserts to your brand. 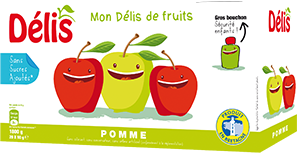 The sugar in our products can be adapted to produce compotes, fruit desserts, light compotes and compotes with no added sugar (classified according to legislation). The textures can be smooth or with fruit pieces. We work with traditionally or organically-grown fruit. Our expertise covers all types of fruit (pear, red fruit, strawberry, multi-fruit, banana, apricot, pineapple, etc.). All fruit, or combinations of fruit, are available upon request. 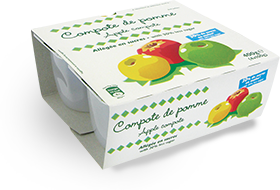 Pots are an essential part of the compote market: their packaging is simple, practical and modern to suit all the family, ideal for storing and enjoying compotes and fruit desserts. Available in packs of 4 to 16 pots. 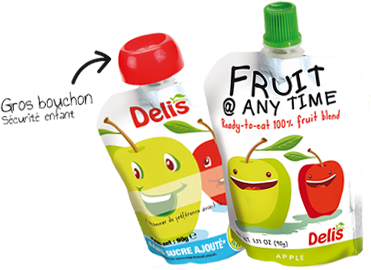 Light, easy to carry and practical to eat, pouches can be found in rucksacks, sports bags, picnic baskets and more, for a fruit-filled break for young and old! Available in single units or packs of 4 to 72 pouches. Our pouches come with standard, easy-to-open caps for family products. And, for the little ones, the LARGE cap ensures optimum safety to avoid swallowing. It is also much easier for little hands to open! Today, we have a presence in France as well as other countries in Western Europe (United Kingdom, Italy, Spain, etc.) and Eastern Europe (in particular the Czech Republic). Our products are also sold in South Africa, South America and the Middle East. Any country is possible upon request. The websites lesvergersdechateaubourg.com, delis-compotes.com and unifruit.fr are published by SAS LES VERGERS DE CHATEAUGBOURG and its subsidiary DELIS SA (hereinafter shown collectively as SAS LES VERGERS DE CHATEAUBOURG). The information contained in these cites are in accordance with French law. By using one of these sites, the visitor accepts having had the possibility of taking knowledge from present terms before the visit and accepts especially and irrevocably, the terms hereinafter. The photography, texts, slogans, drawings, images, videos, animated sequences (with or without sound) as well as all works integrated into the websites are the property of SAS LES VERGERS DE CHATEAUBOURG or of third parties that have authorised SAS LES VERGERS DE CHATEAUBOURG to use them. The contents, pages, scripts, icons or sounds of these sights are the ownership of SAS LES VERGERS DE CHATEAUBOURG or of third parties that have authorised SAS LES VERGERS DE CHATEAUBOURG to use them. All production, reproduction or representation of these sites, entirely or partially (text, sounds or images), on any support whatsoever is prohibited. Lack of respect for this ruling constitutes an act of piracy and the person or persons responsible can be pursued by the law. It is strictly prohibited to use or reproduce the names “VERGERS DE CHATEAUBORURG” and “UNIFRUIT” alone or with their logo, as well as the other brands, such as “DELIS” and other registered models or designs which are the property of SAS LES VERGERS DE CHATEAUBOURG whatever title it might be and especially for advertising purposed without prior written permission of SAS LES VERGERS DE CHATEAUBOURG. SAS LES VERGERS DE CHATEAUBOURG is not responsible for the content of any other site which you could have access to via the sites published by SAS LES VERGERS DE CHATEAUBOURG or its auxiliary sites. SAS LES VERGERS DE CHATEAUBOURG in no way assures a guarantee, deliberate or tacit, concerning all or part of the sites lesvergersdechateaubourg.com delis-compotes.com and unifruit.fr. Neither SAS LES VERGERS DE CHATEAUBOURG, nor the third parties involved in the creation of one of these sites can be held responsible for eventual damages, direct or indirect, material or immaterial, occurring in the case of access or difficulty of access to one of these sites or the use which it could be made, and understood the viruses susceptible to contaminating the configuration of the computer hardware of the user. The information on these sites is provided as such without any guarantee, explicit or implicit, relative to the use of the present publication. The information on these sites can include some inaccuracies or errors. This information is not contractual and subject to modification without prior warning. We remind you that it is not possible to guarantee the confidentiality of transmitted messages on the internet. Also, if you wish to transmit a message with greater levels of security, we recommend using the post. SAS LES VERGERS DE CHATEAUBOURG has put all of its effort into ensuring the accuracy of the information made available on its website. However we off no guarantee whatsoever that the information is exact, complete and up to date.